As the nation’s leading Shakespearean actor and brother of the infamous John Wilkes Booth, the assassin of President Abraham Lincoln, Edwin Booth (1833-1893) had more than enough public notoriety. Born into a theatrical family in Maryland, Booth was the illegitimate son of the Junius Brutus Booth. The young man began his career acting in plays with his father and brother. Edwin then rose to international prominence on his own, considered by many critics to be one of the greatest Hamlets of his day. In 1888, he founded The Player’s Club in his house at 16 Gramercy Park South in New York City. The club still operates on the premises, a testament to Booth’s camaraderie with his theatrical colleagues. When not on stage, Booth was drawn to the coast of Rhode Island for its fine sailing and mild summer climate. He commissioned the supremely talented Calvert Vaux to create his retreat in Middletown. 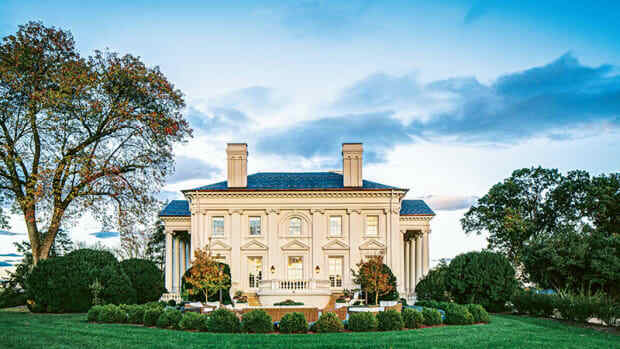 It was the perfect choice—Vaux had been discovered by the noted landscape writer and designer, Andrew Jackson Downing, who invited him to join his firm in 1850. The two men planned the grounds of the White House and the Smithsonian Institution before Downing’s untimely death in 1852. Celebrated as the “Father of American Landscape,” Downing developed the principles of the picturesque in architecture and landscape. Respecting and working with local topography, a love of the sinuous lines found in nature, and an appreciation of rustic forms was the basis of this picturesque ideal, of which Vaux became a devoted and skillful practitioner. Following Downing’s example of writing to promote his aesthetic theories on nature and design, Vaux published the influential book Villas and Cottages (1857). He then went on to greater celebrity in 1858 when he began work on Central Park in New York City with Frederick Law Olmsted. Vaux also had a passion for fine arts and a keen eye for all things visual, joining the National Academy of Design, the Century Club, and serving as a founding member of the American Institute of Architects. His affinity for picturesque environments, wooden structures, and his dedication for creating visually pleasing sight lines in the landscape all came to fruition in his scheme for Boothden. 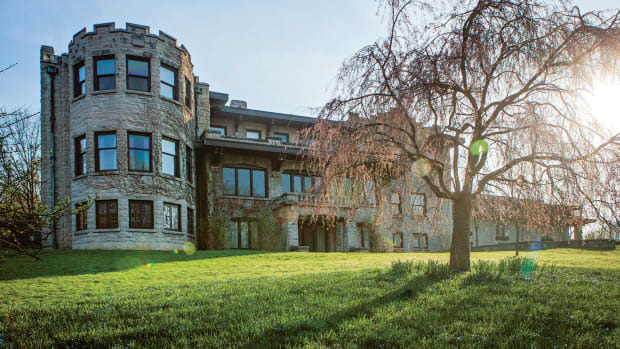 The approach to Boothden reveals much about its owner and its designer. Passing through the lush landscape of Paradise Valley and down long country lanes, the visitor enters a tree-shaded lawn. Before one is a wooden house in the Queen Anne Revival manner with Stick Style motifs. The main façade is a combination of three Queen Anne gables with both plain and wave patterned shingled walls divided into square and rectangular compartments by wooden frames. The shingles give the structure a soft and textured organic feeling, while the Stick Style wooden frames impose an orderly quality on the composition. Windows are comprised of large expanses of plate glass with borders of smaller panes, typical of Queen Anne houses. Inspired by the sweeping roofs and half-timbering of English Medieval buildings and the rustic textures of Japanese architecture, the Queen Anne Revival-style was an amalgam of many sources. Its emphasis was always on the variety of ornament, natural finishes, and integration of the structure into its surroundings. Vaux devised a restrained façade for the entrance, but an open and dynamic treatment reigns on the waterside façade. The architect understood the power of sequence in buildings, moving from contained entrances to expansive views. He employed this in both his parks and his houses to great effect. The plan of Boothden is a long rectangle with a service wing projecting at an angle from the main block. On the waterside façade, the house is all windows and porches. 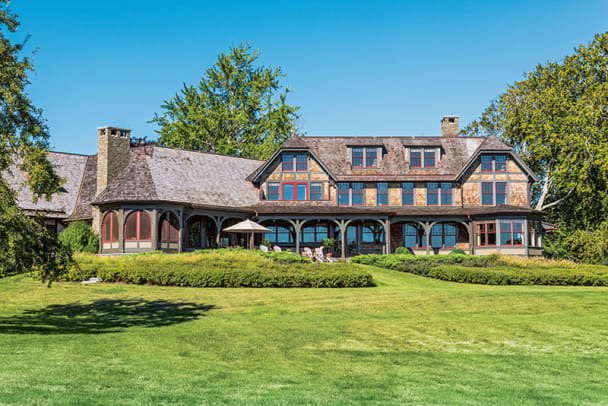 The sequence of the glassed sunroom, open verandah and an octagonal porch with a peaked roof create a zone of spaces for every type of weather and temperature, and always provide sweeping views of the grounds, the Sakonnet River, and the sea beyond. Large jerkin head gables, appearing at either end of the façade, feature a distinctive small downward slant at the top and were inspired by Medieval rural buildings in Britain and Northern Europe. The wood shingles, the green toned framing, and the red colored window mullions all blend effortlessly with the surrounding landscape. Edwin Booth enjoyed his summer villa for ten years. Upon his death in 1893, Edwina, his only child, inherited the estate. She had been engaged to Calvert Vaux’s son, Downing, but he died prematurely by being asphyxiated by gas fumes. Edwina later married and summered in Narragansett, Rhode Island. In 1903, she sold the Boothden, which passed through a series of proprietors from the very grand to the somewhat shady. At one time, a syndicate of bookies rented the house and operated a gambling scam which inspired the 1973 Oscar winning movie, The Sting. T. S. Matthews, the owner of Time Magazine, inherited the estate in 1954 when he was married to his first wife, Julianna Cuyler Matthews. (When Julianna died, he married Martha Gelhorn, the former spouse of Ernest Hemingway.) Accomplished yachtsman and organizer of the 1976 Bicentennial Tall Ships pageant, Avery Seamen, lived in the house with some style until his widow, Eleanor (Jean) Seamen, sold it in 2007. 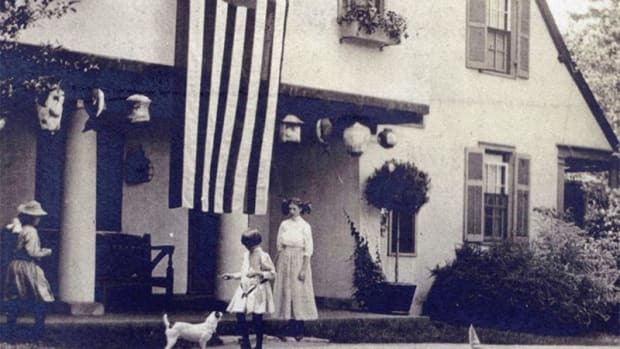 Several decades of owners and their renovations produced many alterations to Boothden. The windmill, with its lower portion containing a henhouse, and the original boathouse, featuring a Japanese style gate, had been demolished, but the main house still retained its air of romance. In 2008, Kim and Larry Ingeneri were inspired to revive the original spirit of the place, remarking, “we fell in love with the setting and the history of the place.” That sense of time and place would be among the guiding principles of their work on the property. Andreozzi Architects and Le Blanc Jones Landscape Architects were engaged in developing a plan to rehabilitate the old estate while updating it for modern living. The house was moved slightly to stabilize the structure with an entirely new foundation and to take advantage of better views of the shoreline. A subtle arrangement of grass terraces, supported by stone retaining walls, were created in front of the waterside façade. The terraces now contain a hot tub, swimming pool, an arbor, and a pool house in the same style as the main house. Following the wave and diamond pane patterns of the original house, the facades were re-sheathed in wood shingles. The high level of detail on the exterior is followed through on the interiors. As a house celebrating the beauty of natural materials, the architect utilized fine carving and millwork throughout every room. Among the finest features is the main staircase, which is a major sculptural element at the heart of the house. Three different spirals turned balusters are used on each step. 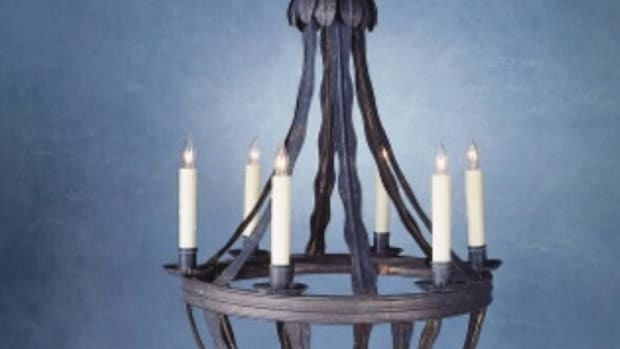 These are revivals of 17th-century-style balusters, appropriate to the Queen Anne Revival style. In fact, David Andreozzi modeled the balusters after originals at a historic house in Stepney Green, London, which were illustrated in Three Centuries of Craftsmanship by Colin Amery. The stained newel posts and railings contrast nicely with the turned balusters, creating a dynamic interplay of dark and light. These newels are a design architect David Andreozzi has been experimenting with in variations over the years and are intended to capture the spirit of old wooden yacht design and craftsmanship. White predominates as the primary color of the interiors, with contrasting tones used sparingly but effectively. Large white painted beams mark the dining room ceiling, while boldly scaled beams also define the ceiling arrangement of the wood stained study. These elements are produced with the generous proportions and fine detail found in a period Queen Anne Revival house. The kitchen is composed of white glass cabinets and cupboards with hardware typical of late 19th-century service rooms. A series of smaller interconnected storage and office spaces extend from the kitchen. These are beautifully developed with an eye towards proper lighting and with fine millwork for windows, doors, and cupboards. The kitchen work area flows into an adjacent dining and sitting room that has a magnificent ribbed wooden ceiling in keeping with the brackets that appear throughout the building. Stone also has its moment at Boothden. The focal point of the octagonal porch is a fireplace in rough-hewn fieldstone supporting a large circular tablet engraved with the image of a windmill. David Andreozzi traced over a historic photograph of the windmill (once on the southwestern edge of this site) to provide the artwork for the design, which was then sandblasted into marble. Cloaked in local legend and lore, the windmill is a symbol of colonial Rhode Island, as these structures dotted the landscape of the region. The stone carving also conjures up the vision of Edwina Booth guiding her father home from a day’s sailing by illuminating the windmill. It is an appropriately romantic gesture for an estate inspired by a romantic approach to both buildings and their settings. As a wooden structure set on a stone foundation, embedded in verdant grounds and overlooking the sea, the house is a combination of materials that are in harmony with nature. The revitalized Boothden now sits serenely in its environs, blending with the colors and contours of the landscape just as Calvert Vaux intended. Through the efforts of the current owners and their design team, both the fabric and spirit of a storied place has been re-created. At Boothden, the paradise envisioned by a renowned actor and made a reality by a talented architect has now been revisited and revitalized for the 21st century. Paradise never looked so tempting. John R. Tschirch is an award-winning architectural historian, writer, and photographer. His work may be seen at johnstories.com.